Now that we’re out of the forest and training on the Memphis Greenline, our focus this week has shifted towards pacing. So why is that important? With my average stride, I can walk 3.5 to 3.75 miles per hour bearing weight, a fairly fast pace for the fuzzybutts… almost a trot for them really. But one of the rules of the road is one must walk their walk. Which basically means, you must abide by nature’s design of you. So since I cannot quicken nor slow my pace for extended periods, nor they, me, most of our training comes down to figuring out how a Man-Pyr (that’s YBD), a French poet and existentialist (that’s Hudson), and a Moose (that’s, well, Moosey) reach a rhythm on the road. I always thought it was god’s greatest joke on me that I choose to go on great journeys with one the most notoriously “independent” breeds. 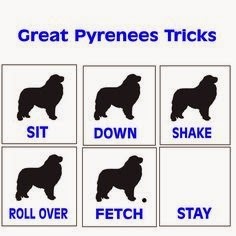 That’s how wonderful rescues like the National Great Pyrenees Rescue characterizes them anyway. I have my own sobriquet for Pyrs, crasser and truer to my southern roots, and one that could and should equally apply to me, too. Such as it is, pacing is a partnership and that’s why it’s of paramount importance at this stage of training. To attain our 25 week West Coast Walk, we must average a little over 12 miles per day. From our work last week and this, I now know that 6 miles per two hours is a comfortable pace for us. That includes a 15-20 minute break halfway and a few ‘stop and sniffs’. But with a laggard and a leader… I’ll let you guess which is which… the science isn’t always that exact. Yer Big Dog’s (YBD’s) Notes 1: I am pleased with our progress and preparation over these past few weeks, although we’ve had a few hiccups throughout… More on that later. YBD’s Notes 2: This week is gear training and filming the Trailer.